202 is your comfortable home away from home. FREE early check in and LATE CHECK OUT as late as 7:30 PM depending on scheduling. FREE HIGH SPEED INTERNET and FREE Long Distance Phone to the U.S. mainland and Canada. My policy is to refund rental payments to the extent that reserved and then canceled dates are then re-rented to other guests. The living areas and master bedroom feature dramatic vaulted ceilings while the lanai has expansive views of the Pacific Ocean along the Kona and Kohala coasts. You’ll experience many spectacular OCEAN SUNSETS while relaxing on this comfortable lanai. 202 also has HDTV in the living room and the bedroom and a Netflix connection as well and many movie DVDs and Hawaiian music CDs. This deluxe, 1400 square foot condo sleeps four but it's also great for just one couple. 202 is a top floor one bedroom with an additional loft bedroom, two bath, luxury villa in the premier condominium complex in Waikoloa Village. 202 is furnished with Polynesian style furniture and decorated with numerous Hawaiian art prints by local artists. 202 is fully furnished, with plenty of quality linens and towels, and equipped in every way. The bedrooms feature top quality beds. The kitchen has everything a cook could want or need. 202 has cable TV, DVD (many movie DVDs provided) and CD stereo player (a number of Hawaiian music CDs provided), Washer and Dryer, Dishwasher, Microwave, Iron and Ironing Board, Snorkels, Fins, and much more. Because it’s a top floor villa 202 is very quiet. ****Please go to the link at the end of this listing to go to our HOME WEB SITE where you'll find more photos of 202 and the Waikoloa/Kohala area. Waikoloa Villas is centrally located and provides easy driving distances to many of the Big Island’s attractions. ‘Anaeho’omalu Bay and the Waikoloa Resort area, where you can enjoy snorkeling along coral reefs, walks along a mile long white sand beach or secluded coves, among rows of coconut palms and along ancient Hawaiian fishponds, are just ten minutes away. At the Waikoloa Resort you can also take a daytime or sunset sailing cruise, a whale watching expedition, a ride in a glass bottom boat, or go on a snorkeling or diving adventure. The Waikoloa Resort also offers fine dining and great shopping at the Kings’ Shops and Queen's Market Place open air plazas. Swimming with dolphins and helicopter rides are also close by. The many other beaches along the Kohala Coast, including the #1 beach in the US, are all just a short drive from 202. Waimea, an old cattle ranching town, with its many fine restaurants, local diners and shopping is just 25 minutes away. The old sugar plantation towns of Hawaii, Kapaau and Honokaa and the ocean side cliffs and valleys of Pololu and Waipio are easy drives from 202. If you’d like the hustle and bustle of the busy Kona area it’s just 35 minutes away but you’ll appreciate the views and quiet of 202 when you return. 202 overlooks the Waikoloa Village Golf Course, designed by Robert Trent Jones Jr., where you’ll enjoy discounted greens fees as our guests. The championship golf courses at Mauna Kea, Mauna Lani, Hapuna Prince, and the Waikoloa Beach and Waikoloa Kings Courses are just minutes away. The Waikoloa Village Shopping Center is a pleasant five minute stroll along the golf course or a quick one minute drive from 202. There you’ll find a modern food market with on site bakery and deli departments, banking, a pharmacy, a beauty salon and other shops to enjoy. The Villas has beautiful, tropical landscaping, TWO swimming pools with Jacuzzis and barbecue facilities. You’ll enjoy the comfort and beauty of your stay at Villas B 202. “I can honestly say that A .J.’s 202 at the Waikoloa Villas is a lovely Hawaiian get away spot that’s very quiet and affordable. Sunsets on the lanai are especially memorable. Our next vacation in Hawaii will be at A. J.’s condo.” Bonnie Horsley, Redwood City, California. “I want to thank you for the great time we had staying at your condo. Everything was exactly as represented on the Internet and your advice and condo made our trip a real success.” Marilyn Murphy, Scottsdale, Arizona. “Just a note to let you know how much we enjoyed our stay in 202 Villas. The view from the lanai was superb, parking was always available and 202 is spacious, exceptionally clean and very cheerful. My wife and I really appreciate your attention to detail and the help you provided while we were there. We’ll contact you first for our next trip to the Big Island.” Wayne Jensen, Chippewa Falls, Wisconsin. I moved to the Big Island from California twenty years ago and I've enjoyed every day here. The many large or small private beaches, the mountains, the great weather, the ocean, racing in large or small Hawaiian canoes, snorkeling along the reefs, fishing along the coast or hiking in the mountains, performances at the Kahilu Theatre in Waimea, all the fine restaurants, the farmers' markets, there is always something different to do. 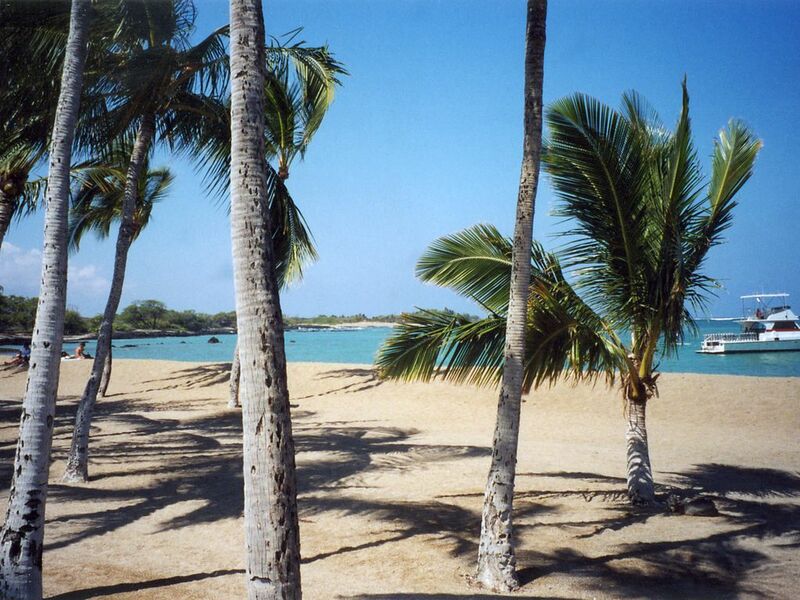 I chose the Waikoloa/Kohala area for my home and the condos because of the great weather and the proximity to the Waikoloa/Kohala beaches which are unsurpassed on the Big Island and certainly some of the best anywhere. I bought condos close to my home so that I can ensure that the condos and everything in them are in top condition at all times. Plus, I'm close by if needed for any reason, even if just to answer questions about the area or give directions, etc. I occasionally spend an evening at the condos because they're close to my home and to make sure that everything is as I would want it to be if I were a guest there. View more about A. J. (4) Portable Phones Plus Answering Machine. Top Quality Sheets, Towels, etc. Washer and Dryer in the condo. Washer and Dryer in ther condo. Fully equipped kitchen. Everything a cook might want or need. Hawaiian and other music CDs. FREE Late Check Out as late as 7 PM (as per scheduling)!Snorkels, fins, masks and other beach gear in condo, tennis rackets in condo, Big Island tour books, just a short walk to the Waikoloa Golf Club and Tennis Courts and the Waikoloa Shopping Center, Five Large Closets. We spent 4 weeks at A.J.s condo in Waikoloa village. The condo was what we were looking for and met our needs very nicely. Clean ,quiet, and an excellent location central to most spots on the island and a short 15 minute drive to the great beaches. The condo was well stocked with the basic needs as well as a couple bags of great coffee also beach chairs and umbrellas which we put to good use. There was also snorkel gear which we didn't use, The condo is directly across from the pool and bbq area. No need for ac as the condo caught the night breeze nicely and we slept very well.Nice view of the grounds and golf course with a nice distant view of the ocean.Would stay here again if we get to return..Thanks for the use of your place AJ!! I'm pleased that this friendly couple from Canada enjoyed staying in my condo for a month. They were very responsible guests and easy to work with. Of course, they're are welcome back any time. This condo is very spacious, neat and clean, equipped with anything you may need and you can't beat the location - fast and easy access to the main roads for exploring the beautiful sites on the island and many options for restaurants, grocery stores, coffee shops, beaches and even a movie theater nearby. We were very pleased with our stay! I am happy that these guests appreciated what I offer at the Waikoloa Villas. It was an easy distance for them to attend their conference at the Mauna Lani. They were great guests and are certainly welcome back any time. A nice property considerately kitted out with the things that make a stay more fun - from snorkel gear to laundry detergent. WE especially appreciated the tourist guide book and the coffee. Close to all the Kohala Coast beaches and golf courses, great snorkeling, swimming with dolphins, many fine restaurants, whale watching. FEEL FREE TO WRITE OR CALL A. J. AT HOME ON THE BIG ISLAND (808 880 1410) WITH ANY QUESTIONS ABOUT B202 OR THE WAIKOLOA/KOHALA AREA. ALL RATES ARE FOR A MAXIMUM OF FOUR GUESTS. ALL RATES PLUS 15.417% HAWAII TAXES. (HI T.A.T. W00026868-01) ALL RATES PLUS $135 CLEANING FEE. DISCOUNTED RATES FOR EXTENDED STAYS.